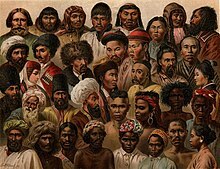 The largest ethnic groups in modern times comprise hundreds of millions of individuals (Han Chinese being the largest), while the smallest are limited to a few dozen individuals (numerous indigenous peoples worldwide). Larger ethnic groups may be subdivided into smaller sub-groups known variously as tribes or clans, which over time may become separate ethnic groups themselves due to endogamy or physical isolation from the parent group. Conversely, formerly separate ethnicities can merge to form a pan-ethnicity and may eventually merge into one single ethnicity. Whether through division or amalgamation, the formation of a separate ethnic identity is referred to as ethnogenesis. The term ethnic is derived from the Greek word ἔθνος ethnos (more precisely, from the adjective ἐθνικός ethnikos, which was loaned into Latin as ethnicus). The inherited English language term for this concept is folk, used alongside the latinate people since the late Middle English period. 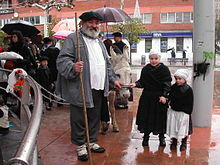 In Early Modern English and until the mid-19th century, ethnic was used to mean heathen or pagan (in the sense of disparate "nations" which did not yet participate in the Christian oikumene), as the Septuagint used ta ethne ("the nations") to translate the Hebrew goyim "the nations, non-Hebrews, non-Jews". The Greek term in early antiquity (Homeric Greek) could refer to any large group, a host of men, a band of comrades as well as a swarm or flock of animals. In Classical Greek, the term took on a meaning comparable to the concept now expressed by "ethnic group", mostly translated as "nation, people"; only in Hellenistic Greek did the term tend to become further narrowed to refer to "foreign" or "barbarous" nations in particular (whence the later meaning "heathen, pagan"). In the 19th century, the term came to be used in the sense of "peculiar to a race, people or nation", in a return to the original Greek meaning. The sense of "different cultural groups", and in American English "racial, cultural or national minority group" arises in the 1930s to 1940s, serving as a replacement of the term race which had earlier taken this sense but was now becoming deprecated due to its association with ideological racism. The abstract ethnicity had been used for "paganism" in the 18th century, but now came to express the meaning of an "ethnic character" (first recorded 1953). The term ethnic group was first recorded in 1935 and entered the Oxford English Dictionary in 1972. Depending on the context that is used, the term nationality may either be used synonymously with ethnicity, or synonymously with citizenship (in a sovereign state). The process that results in the emergence of an ethnicity is called ethnogenesis, a term in use in ethnological literature since about 1950.
shared customs (Greek: ἤθεα ὁμότροπα - ēthea homotropa, "customs of like fashion"). One is between "primordialism" and "instrumentalism". In the primordialist view, the participant perceives ethnic ties collectively, as an externally given, even coercive, social bond. The instrumentalist approach, on the other hand, treats ethnicity primarily as an ad-hoc element of a political strategy, used as a resource for interest groups for achieving secondary goals such as, for instance, an increase in wealth, power, or status. This debate is still an important point of reference in Political science, although most scholars' approaches fall between the two poles. The second debate is between "constructivism" and "essentialism". Constructivists view national and ethnic identities as the product of historical forces, often recent, even when the identities are presented as old. Essentialists view such identities as ontological categories defining social actors, and not the result of social action. Max Weber maintained that ethnic groups were künstlich (artificial, i.e. a social construct) because they were based on a subjective belief in shared Gemeinschaft (community). Secondly, this belief in shared Gemeinschaft did not create the group; the group created the belief. Third, group formation resulted from the drive to monopolise power and status. This was contrary to the prevailing naturalist belief of the time, which held that socio-cultural and behavioral differences between peoples stemmed from inherited traits and tendencies derived from common descent, then called "race". Another influential theoretician of ethnicity was Fredrik Barth, whose "Ethnic Groups and Boundaries" from 1969 has been described as instrumental in spreading the usage of the term in social studies in the 1980s and 1990s. Barth went further than Weber in stressing the constructed nature of ethnicity. To Barth, ethnicity was perpetually negotiated and renegotiated by both external ascription and internal self-identification. Barth's view is that ethnic groups are not discontinuous cultural isolates, or logical a prioris to which people naturally belong. He wanted to part with anthropological notions of cultures as bounded entities, and ethnicity as primordialist bonds, replacing it with a focus on the interface between groups. "Ethnic Groups and Boundaries", therefore, is a focus on the interconnectedness of ethnic identities. Barth writes: "... categorical ethnic distinctions do not depend on an absence of mobility, contact and information, but do entail social processes of exclusion and incorporation whereby discrete categories are maintained despite changing participation and membership in the course of individual life histories." In this way, he pointed to the fact that identification of an ethnic group by outsiders, e.g. anthropologists, may not coincide with the self-identification of the members of that group. He also described that in the first decades of usage, the term ethnicity had often been used in lieu of older terms such as "cultural" or "tribal" when referring to smaller groups with shared cultural systems and shared heritage, but that "ethnicity" had the added value of being able to describe the commonalities between systems of group identity in both tribal and modern societies. Cohen also suggested that claims concerning "ethnic" identity (like earlier claims concerning "tribal" identity) are often colonialist practices and effects of the relations between colonized peoples and nation-states. [C]ategorizations about identity, even when codified and hardened into clear typologies by processes of colonization, state formation or general modernizing processes, are always full of tensions and contradictions. Sometimes these contradictions are destructive, but they can also be creative and positive. Social scientists have thus focused on how, when, and why different markers of ethnic identity become salient. Thus, anthropologist Joan Vincent observed that ethnic boundaries often have a mercurial character. Ronald Cohen concluded that ethnicity is "a series of nesting dichotomizations of inclusiveness and exclusiveness". He agrees with Joan Vincent's observation that (in Cohen's paraphrase) "Ethnicity ... can be narrowed or broadened in boundary terms in relation to the specific needs of political mobilization. This may be why descent is sometimes a marker of ethnicity, and sometimes not: which diacritic of ethnicity is salient depends on whether people are scaling ethnic boundaries up or down, and whether they are scaling them up or down depends generally on the political situation. Different approaches to understanding ethnicity have been used by different social scientists when trying to understand the nature of ethnicity as a factor in human life and society. As Jonathan M. Hall observes, World War II was a turning point in the ethnic studies. The consequences of Nazi racism discouraged essentialist interpretations of ethnic groups and race. Ethnic groups came to be defined as social rather than as biological entities. Their coherence was attributed to shared myths, descent, kinship, a common place of origin, language, religion, customs and national character. So, ethnic groups are conceived as mutable rather than stable, constructed in discursive practices rather than written in the genes. "Essentialist primordialism" further holds that ethnicity is an a priori fact of human existence, that ethnicity precedes any human social interaction and that it is basically unchanged by it. This theory sees ethnic groups as natural, not just as historical. It also has problems dealing with the consequences of intermarriage, migration and colonization for the composition of modern day multi-ethnic societies. "Kinship primordialism" holds that ethnic communities are extensions of kinship units, basically being derived by kinship or clan ties where the choices of cultural signs (language, religion, traditions) are made exactly to show this biological affinity. In this way, the myths of common biological ancestry that are a defining feature of ethnic communities are to be understood as representing actual biological history. A problem with this view on ethnicity is that it is more often than not the case that mythic origins of specific ethnic groups directly contradict the known biological history of an ethnic community. "Geertz's primordialism", notably espoused by anthropologist Clifford Geertz, argues that humans in general attribute an overwhelming power to primordial human "givens" such as blood ties, language, territory, and cultural differences. In Geertz' opinion, ethnicity is not in itself primordial but humans perceive it as such because it is embedded in their experience of the world. "Perennialism", an approach that is primarily concerned with nationhood but tends to see nations and ethnic communities as basically the same phenomenon, holds that the nation, as a type of social and political organisation, is of an immemorial or "perennial" character. Smith (1999) distinguishes two variants: "continuous perennialism", which claims that particular nations have existed for very long spans of time, and "recurrent perennialism", which focuses on the emergence, dissolution and reappearance of nations as a recurring aspect of human history. "Instrumentalist perennialism", while seeing ethnicity primarily as a versatile tool that identified different ethnics groups and limits through time, explains ethnicity as a mechanism of social stratification, meaning that ethnicity is the basis for a hierarchical arrangement of individuals. According to Donald Noel, a sociologist who developed a theory on the origin of ethnic stratification, ethnic stratification is a "system of stratification wherein some relatively fixed group membership (e.g., race, religion, or nationality) is utilized as a major criterion for assigning social positions". Ethnic stratification is one of many different types of social stratification, including stratification based on socio-economic status, race, or gender. According to Donald Noel, ethnic stratification will emerge only when specific ethnic groups are brought into contact with one another, and only when those groups are characterized by a high degree of ethnocentrism, competition, and differential power. Ethnocentrism is the tendency to look at the world primarily from the perspective of one's own culture, and to downgrade all other groups outside one's own culture. Some sociologists, such as Lawrence Bobo and Vincent Hutchings, say the origin of ethnic stratification lies in individual dispositions of ethnic prejudice, which relates to the theory of ethnocentrism. Continuing with Noel's theory, some degree of differential power must be present for the emergence of ethnic stratification. In other words, an inequality of power among ethnic groups means "they are of such unequal power that one is able to impose its will upon another". In addition to differential power, a degree of competition structured along ethnic lines is a prerequisite to ethnic stratification as well. The different ethnic groups must be competing for some common goal, such as power or influence, or a material interest, such as wealth or territory. Lawrence Bobo and Vincent Hutchings propose that competition is driven by self-interest and hostility, and results in inevitable stratification and conflict. "Constructivism" sees both primordialist and perennialist views as basically flawed, and rejects the notion of ethnicity as a basic human condition. It holds that ethnic groups are only products of human social interaction, maintained only in so far as they are maintained as valid social constructs in societies. "Modernist constructivism" correlates the emergence of ethnicity with the movement towards nation states beginning in the early modern period. Proponents of this theory, such as Eric Hobsbawm, argue that ethnicity and notions of ethnic pride, such as nationalism, are purely modern inventions, appearing only in the modern period of world history. They hold that prior to this, ethnic homogeneity was not considered an ideal or necessary factor in the forging of large-scale societies. Ethnicity is an important means by which people may identify with a larger group. Many social scientists, such as anthropologists Fredrik Barth and Eric Wolf, do not consider ethnic identity to be universal. They regard ethnicity as a product of specific kinds of inter-group interactions, rather than an essential quality inherent to human groups. Processes that result in the emergence of such identification are called ethnogenesis. Members of an ethnic group, on the whole, claim cultural continuities over time, although historians and cultural anthropologists have documented that many of the values, practices, and norms that imply continuity with the past are of relatively recent invention. 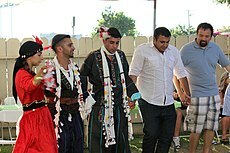 Ethnic groups differ from other social groups, such as subcultures, interest groups or social classes, because they emerge and change over historical periods (centuries) in a process known as ethnogenesis, a period of several generations of endogamy resulting in common ancestry (which is then sometimes cast in terms of a mythological narrative of a founding figure); ethnic identity is reinforced by reference to "boundary markers" - characteristics said to be unique to the group which set it apart from other groups. Ethnicity theory says that race is a social category and is but one of several factors in determining ethnicity. Some other criteria include: "religion, language, 'customs,' nationality, and political identification". This theory was put forth by sociologist Robert E. Park in the 1920s. It is based on the notion of “culture”. This theory was preceded by over a century where biological essentialism was the dominant paradigm on race. Biological essentialism is the belief that white European races are biologically superior and other non-white races are inherently inferior. This view arose as a way to justify slavery of Africans and genocide of the Native Americans in a society which was supposedly founded on freedom for all. This was a notion that developed slowly and came to be a preoccupation of scientists, theologians, and the public. Religious institutions asked questions about whether there had been multiple genesis's (polygenesis) and whether God had created lesser races of men. Many of the foremost scientists of the time took up idea of racial difference. They would inadvertently find that white Europeans were superior. One method that was used was the measurement of cranial capacity. Michael Omi and Howard Winant's theory of racial formation directly confronts both ethnicity theory's premises and practices. They argue in Racial Formation in the United States that ethnicity theory was exclusively based on the immigration patterns of a white ethnic population and did not account for the unique experiences of non-whites in this country. While this theory identities different stages in an immigration process – contact, conflict, struggle, and as the last and best response, assimilation – it did so only for white ethnic communities. The ethnicity paradigm neglects the ways that race can complicate a community's interactions with basic social and political structures, especially upon contact. And assimilation – shedding the particular qualities of a native culture for the purpose of blending in with a host culture – did not work for some groups as a response to racism and discrimination as it did for others. Moreover, once the legal barriers to achieving equality had been dismantled, the problem of racism became the sole responsibility of already disadvantaged communities. It was assumed that if a Black or Latino community was not 'making it' by the standards that had been set by white ethnics, it was because that community did not hold the right values or beliefs. Or they must be stubbornly resisting dominant norms because they did not want to fit in. Omi and Winant's critique of ethnicity theory explains how looking towards a cultural defect for the source of inequality ignores the "concrete sociopolitical dynamics within which racial phenomena operate in the U.S." In other words, buying into this approach effectively strips us of our ability to critically examine the more structural components of racism and encourages, instead, a “benign neglect” of social inequality. In some cases, especially involving transnational migration, or colonial expansion, ethnicity is linked to nationality. Anthropologists and historians, following the modernist understanding of ethnicity as proposed by Ernest Gellner and Benedict Anderson see nations and nationalism as developing with the rise of the modern state system in the 17th century. They culminated in the rise of "nation-states" in which the presumptive boundaries of the nation coincided (or ideally coincided) with state boundaries. Thus, in the West, the notion of ethnicity, like race and nation, developed in the context of European colonial expansion, when mercantilism and capitalism were promoting global movements of populations at the same time that state boundaries were being more clearly and rigidly defined. In the 19th century, modern states generally sought legitimacy through their claim to represent "nations." Nation-states, however, invariably include populations that have been excluded from national life for one reason or another. Members of excluded groups, consequently, will either demand inclusion on the basis of equality, or seek autonomy, sometimes even to the extent of complete political separation in their own nation-state. Under these conditions – when people moved from one state to another, or one state conquered or colonized peoples beyond its national boundaries – ethnic groups were formed by people who identified with one nation, but lived in another state. Multi-ethnic states can be the result of two opposite events, either the recent creation of state borders at variance with traditional tribal territories, or the recent immigration of ethnic minorities into a former nation state. Examples for the first case are found throughout Africa, where countries created during decolonisation inherited arbitrary colonial borders, but also in European countries such as Belgium or United Kingdom. Examples for the second case are countries such as Germany or the Netherlands, which were relatively ethnically homogeneous when they attained statehood but have received significant immigration during the second half of the 20th century. States such as the United Kingdom, France and Switzerland comprised distinct ethnic groups from their formation and have likewise experienced substantial immigration, resulting in what has been termed "multicultural" societies especially in large cities. In recent decades feminist scholars (most notably Nira Yuval-Davis) have drawn attention to the fundamental ways in which women participate in the creation and reproduction of ethnic and national categories. Though these categories are usually discussed as belonging to the public, political sphere, they are upheld within the private, family sphere to a great extent. It is here that women act not just as biological reproducers but also as 'cultural carriers', transmitting knowledge and enforcing behaviours that belong to a specific collectivity. Women also often play a significant symbolic role in conceptions of nation or ethnicity, for example in the notion that 'women and children' constitute the kernel of a nation which must be defended in times of conflict, or in iconic figures such as Britannia or Marianne. Race and ethnicity are considered as[by whom?] related concepts. Ethnicity is used as a matter of cultural identity of a group, often based on shared ancestry, language and cultural traditions, while race is applied as a pseudoscientific grouping, based on physical similarities within groups. Race is a more controversial subject than ethnicity, due to common political use of the term. It is assumed[by whom?] that, based on power relations, there exist "racialized ethnicities" and "ethnicized races". Ramón Grosfoguel (University of California, Berkeley) argues that 'racial/ethnic identity' is one concept and that concepts of race and ethnicity cannot be used as separate and autonomous categories. Before Weber (1864-1920), race and ethnicity were primarily seen as two aspects of the same thing. Around 1900 and before, the essentialist primordialist understanding of ethnicity predominated: cultural differences between peoples were seen as being the result of inherited traits and tendencies. With Weber's introduction of the idea of ethnicity as a social construct, race and ethnicity became more divided from each other. "National, religious, geographic, linguistic and cultural groups do not necessarily coincide with racial groups: and the cultural traits of such groups have no demonstrated genetic connection with racial traits. Because serious errors of this kind are habitually committed when the term 'race' is used in popular parlance, it would be better when speaking of human races to drop the term 'race' altogether and speak of 'ethnic groups'." According to Wolf, racial categories were constructed and incorporated during the period of European mercantile expansion, and ethnic groupings during the period of capitalist expansion. The term 'ethnic' popularly connotes '[race]' in Britain, only less precisely, and with a lighter value load. In North America, by contrast, '[race]' most commonly means color, and 'ethnics' are the descendants of relatively recent immigrants from non-English-speaking countries. '[Ethnic]' is not a noun in Britain. In effect there are no 'ethnics'; there are only 'ethnic relations'. In the U.S., the OMB defines the concept of race as outlined for the US Census as not "scientific or anthropological" and takes into account "social and cultural characteristics as well as ancestry", using "appropriate scientific methodologies" that are not "primarily biological or genetic in reference". Many ethnic groups and nations of Africa qualify, although some groups are of a size larger than a tribal society. These mostly originate with the Sahelian kingdoms of the medieval period, such as that of the Akan, deriving from Bonoman (11th century) then the Kingdom of Ashanti (17th century). The Irish are an ethnic group indigenous to Ireland who total 70-80 million worldwide. Europe has a large number of ethnic groups; Pan and Pfeil (2004) count 87 distinct "peoples of Europe", of which 33 form the majority population in at least one sovereign state, while the remaining 54 constitute ethnic minorities within every state they inhabit (although they may form local regional majorities within a sub-national entity). The total number of national minority populations in Europe is estimated at 105 million people, or 14% of 770 million Europeans. A number of European countries, including France, and Switzerland do not collect information on the ethnicity of their resident population. ^ a b Noel, Donald L. (1968). "A Theory of the Origin of Ethnic Stratification". Social Problems. 16 (2): 157–172. doi:10.1525/sp.1968.16.2.03a00030. ^ a b c Bobo, Lawrence; Hutchings, Vincent L. (1996). "Perceptions of Racial Group Competition: Extending Blumer's Theory of Group Position to a Multiracial Social Context". American Sociological Review. American Sociological Association. 61 (6): 951–972. doi:10.2307/2096302. JSTOR 2096302. ^ Grosfoguel, Ramán (September 2004). "Race and Ethnicity or Racialized Ethnicities? Identities within Global Coloniality". Ethnicities. 315-336. 4 (3): 315. doi:10.1177/1468796804045237. Retrieved 2012-08-06.